How anyone in the media can cover the latest Flotilla as a movement which represents progressive politics, in even the broadest sense of that word, is truly one of the mysteries of modern journalism. As I pointed out previously, one of the literary celebrities on board the U.S. vessel is Alice Walker – who is on record comparing Israel with Nazi Germany. You’d think that a movement affiliated with someone leveling such an ugly and hateful charge would diminish the progressive luster of the movement, but the Guardian, as with much of the mainstream media, has demonstrated a tremendous capacity at ignoring facts which contradict a preconceived narrative of immutable Palestinian victimhood and Israeli villainy. More recently, the U.S. Boat to Gaza, which is about to set sail in order to break Israel’s blockade of lethal weapons flowing into Hamas-controlled Gaza, is proudly advertising a benefit featuring Gilad Atzmon. How anti-Semitic is this acclaimed jazz saxophonist? This is more than mere bigotry against Jews. Its’ rhetorical evil that is simply indistinguishable from Nazi and other classic expressions of historical Jew-hatred. So he thinks those other Jews really do control the world, eh? But then why do they want to destroy it? Are they all masochists like Atzmon? atzmon BELONGS in the self-destructive progressively fasscist UK. Atzmon is so vehemently anti-semitic and so lacking in logic that his ramblings seem to be the work of someone who is mentally ill. I consider all anti-semitism to be a form of mental illness, but Atzmon seems to go beyond the usual. Not that is an excuse – he’s an evil, violent person who deserves no sympathy or leeway. But if makes me wonder about anyone who would give credence to or promote a (literal) madman. So the mask has slipped (again). This stinking Flotilla is sailing on a sea of anti-semitism. If they all drowned, the world would be a better place. Poor misbenighted souls who are sailing on this stupid flottila lark – their moral turpitude has all the attraction of a bad case of leprosy. “Forty percent of Irish people wouldn’t allow a Jew into their family. Atzmon has the same problem as Helen Thomas: He’s too honest. His fellow Progressivists disavow him, not because they disagree with his views, but because he’s not being helpful putting those views all out in the open in their true form when the Progressivists are anxious to hide the ugliness behind a curtain of attractive language (“Our struggle is for equal rights in Palestine!” etc.). Is it honesty or some sort of failure to censor what he is thinking before he spits it out of his mouth? That indicates some sort of cognitive deficit or child like immaturity certainly. Isn’t he a mossad agent…. Maybe he’s just a misunderstood Israeli killer shark trainer. People like him should be confronted and stopped. The Muslims have very effective methods against people like this jerk. These methods might be extreme,but then they are extremely effective. 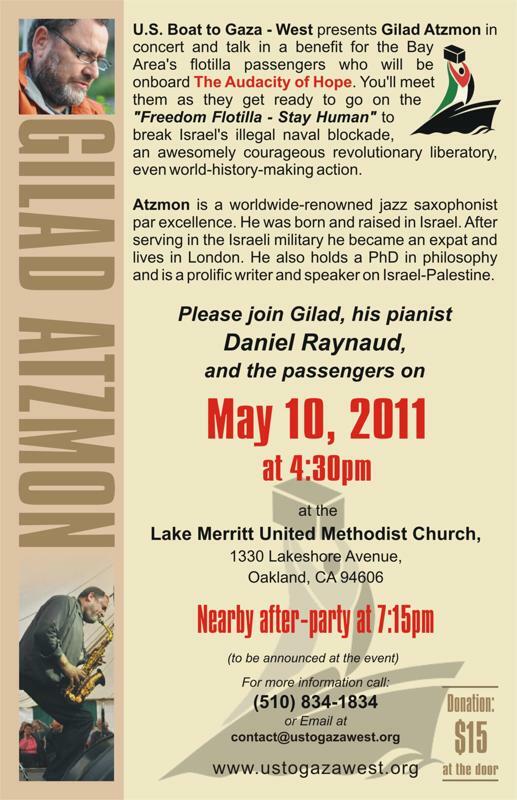 The poster says “Gilad Atzmon is a worldwide-renowned jazz saxophonist”. He is undoubtedly more (in)famous for frankly being a complete nutter. It is Atzmon’s blunt anti-Zionism rather than his music that has given him an international profile, particularly in the Arab world, where his essays are widely read.